Along with the growing awareness of the scope, magnitude and implications of forest related conflict, the demand for practical assistance in conflict management has increased. FAO offers a variety of professional support services and training to strengthen national capacity in conflict management, including introductory, skill building and mentored training programmes. These are based on FAO’s experience with collaborative strategies for the prevention and management of forest related conflicts in various countries around the world. The focus of FAO's training programmes is on ‘Alternative Dispute Resolution’ (ADR) as an overarching term for collaborative strategies which can be used in a variety of ways to prevent or manage conflict. Collaborative based strategies are geared to remove misunderstandings, clarify interests and establish common ground between the many different stakeholders often involved in forest management and forest policy decisions. Each program is tailored to meet the specific training needs of the stakeholders, running from half a day to several months. . Introductory programmes are directed at decision maker at policy level policy aiming to raise awareness and to solicit political and institutional support. Mentored training programmes are designed as practical learning experiences for natural resource management professionals working at the field level. Partners have included The Regional Community Forestry Training Centre for Asia and the Pacific (RECOFTC); German Technical Cooperation (GTZ); Capacity Building International (InWent); West Africa Network for Peacebuilding (WANEP); Ugandan National Forest Authority, Ugandan Ministry of Water, Lands and Environment, Environmental Alert, Uganda; Namibian Ministry for Environmental Tourism; The Indonesian Centre for Environmental Law (ICEL) and the Indonesian Ministry of Forestry. The overall objective of FAO capacity building programme is to expand and strengthen the capacity of participants to diagnose and understand tensions and conflict and to respond to them in a professional and effective way. provide participants with an understanding of the basic principles, skills and techniques used to analyse tensions and conflicts and to overcome difficult situations. Increases participants knowledge and skills in analyzing conflict and in developing strategies to manage conflict. They will learn from a variety of conflict management techniques in order to negotiate and/or build agreements themselves or to initiate conflict resolution processes and see them through. Provide skills and knowledge for participants to tackle diverse issues including: disputes over ownership and user rights; conflicts over benefit sharing and devolution of power; conflicts over logging concessions; and others. The design of FAO’s capacity building programmes are characterized by some distinctive features. First, they are based on an experiential learning approach which involves participants in a process of ongoing critical reflection, allowing them to link the course contents with their own experiences and apply conflict management tools and techniques in their daily work. 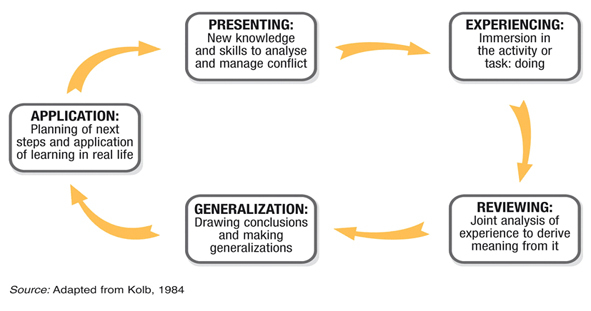 As shown in the figure 1 below, experiential learning is structured around participants’ ability to learn new knowledge and skills for analysing and managing conflicts, experience these knowledge and skills by applying it in a safe learning environment, review of the experiences made to jointly draw conclusions for application of learning in real life situations. Another distinctive feature of FAO training on conflict management is that the experiential learning approach is converted wherever possible into a multiple, integrated phased program that combines classroom training with appropriate mentor-supported field practice. Ideally these integrated programs run for a couple of months. Classroom training is conducted at various stages of a programme; between classroom sessions, participants are expected to apply their new knowledge and skills to real-life conflict situations in their own work context. During these periods of application, participants are coached/mentored by the trainer, who assists with specific conflict management or training methods and concepts; responds to questions and supports problem solving; and provides constructive feedback on participants’ performance, encouraging reflection and self-assessment. At the end of a programme, a lessons learned workshop provides participants with an opportunity to share and evaluate their experiences and learning from classroom training and conflict interventions. Click on the box below to view a video summarizing key findings from a Training of Trainers on conflict management for Asia and the Pacific.